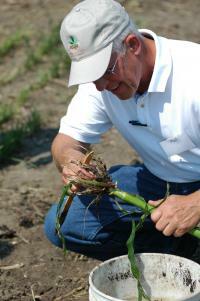 Dr. Bob Hartzler is a professor of agronomy and an extension weed specialist. He conducts research on weed biology and how it impacts the efficacy of weed management programs in corn and soybean. Dr. Hartzler also teaches undergraduate classes in weed science and weed identification. Is 80% of Iowa waterhemp really resistant to Group 14 herbicides? Planning on attending the Commodity Classic in San Antonio in March? Have experience with herbicide resistant weeds? Is this ad Hall of Shame worthy?